Because life is short and there are plenty of empty eye calories to consume, users apparently spend an average of 1.8 seconds considering each title presented to them while on Netflix. In general, if a selection isn’t made within 90 seconds spent on the platform, they’ll move onto something else. “We were surprised by how much impact an image had on a member finding great content, and how little time we had to capture their interest,” writes Nelson. If even Netflix employees are shocked at how short attention spans have become, surely that must be cause for concern. Anyway, the post’s key takeaways with respect to images are that complex emotions, bad guys, and less people consistently lead to higher engagement. 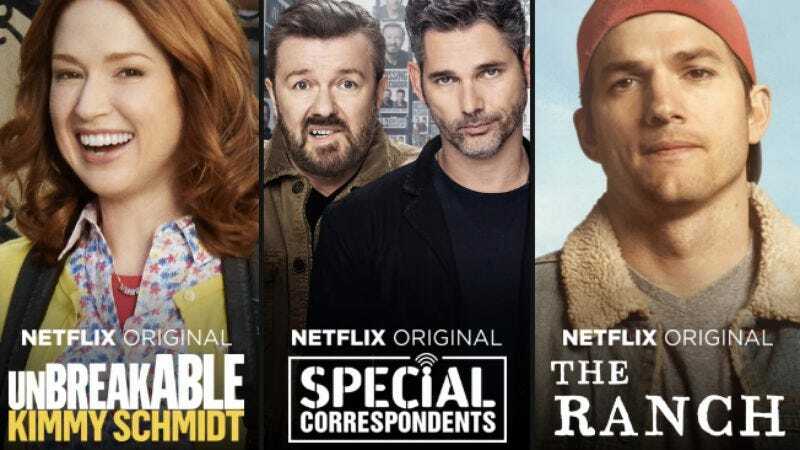 For example, among a variety of promotional images for season two of Unbreakable Kimmy Schmidt, the one with Kimmy and Titus reacting strongly scored the best. The post also details that an image’s likelihood of beating out others drops significantly when it contains more than three people, a finding that prompted Orange Is The New Black to switch from a thumbnail featuring several Litchfield inmates to one focused on just Piper. Also, the above trends can differ greatly depending on the country—while U.S. viewers of Sense8 liked a shot of one of the main characters, Germans preferred a stylish No. 8 with the show’s logo in the foreground.